When is the last time that you hopped in your 401k on a hot July night and took it for a spin? When you take your family out on a Sunday drive in your IRA or stock portfolio, do people honk their horns and give you the thumbs up? Silly suggestions, yes, but buying a classic car as an investment truly allows you to enjoy your investment while that investment grows. How much is that worth to you? Can you put a price on the admiration of your friends and neighbors or the smiles on your kid's faces as your cruise in your classic car? Obviously museum quality, rare classic cars have their special place as an investment. The stock market, for example, averages around an 8% return over an extended period of say 10 years. However, in any given 1-3 year period, the market may even average a negative return on your investment. 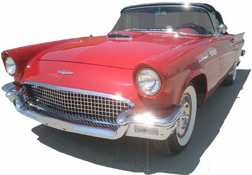 Classic car values have remained stable and are increasing each year. An example of how a classic car can be used as an investment is, say you were to buy a car for $8,000 then sell it 2 years later for $9,500. Your return would be 18.7% or over 9% a year. That is a return on your money that rivals an average stock market gain. Now I'm not suggesting that each year you can expect to gain such a return or that you would even want to part with your prized possession, but it is fairly certain that most classic cars will not lose their value over time if they are well maintained. I am not also advocating selling all of your stock and trading it in for a stable of classic cars, but classic cars can be a part of your overall investment strategy and bring you a satisfaction that money can't buy.